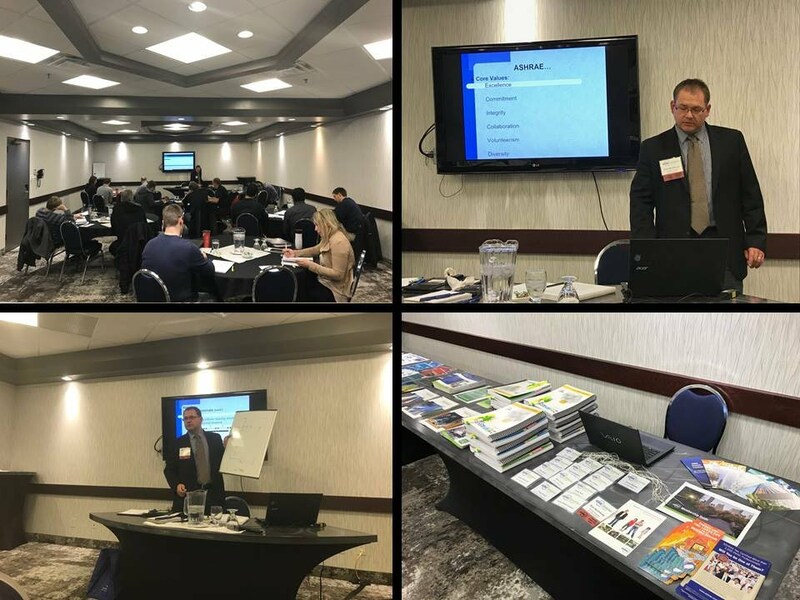 ASHRAE Saskatoon Chapter was pleased to organize a 2-Days Course "Fundamentals of Air System Design" on April 10 and 11. It was a pleasure having 16 bright minds in one room sharing and learning about HVAC fundamentals from our knowledgeable Instructor Ryan MacGillivray. 2018 CTTC Course "Fundamentals of Air Systems Design"
A recent engineering graduate working in the HVAC&R industry. An experienced engineer who has entered the HVAC&R industry from another engineering field. An architect, engineer, technician, or construction or building management professional who wants to increase your knowledge of air distribution systems. The attached brochure contains detailed information about the course topics, agenda, and registration. Registration for the Short Course is open and can be made on-line, as mentioned in the attached brochure. Fee Covers: Course admittance, course materials, publications, break refreshments, lunches, and reception. o October 2-3, 2014, ASHRAE, International Conference on Efficient Building Design: Materials and HVAC Equipment Technologies, Beirut, Lebanon. o January 24-28, 2015, ASHRAE Winter meeting / AHR Show, Chicago, IL. o May 22-24, 2015, 2015 International Conference on Energy and Environment in Ships, Athens, Greece. o June 27-July 1, 2015, ASHRAE Annual Conference, Atlanta, GA.
o January 23-27, 2016, ASHRAE Winter meeting / AHR Show, Orlando, FL. o June 25-29, 2016, ASHRAE Annual Conference, St. Louis, MO. o January 22-24, 2018, ASHRAE Winter meeting / AHR Show, Chicago, IL. CTT Technology Award Submission: St. Mary’s School by Chris Conley of Daniels-Wingerak Engineering Ltd. – awarded Second Place in the New Educational Facilities category at the CRC. Jeff Frie given Chapter Service Award, and ASHRAE RP Certificate of Appreciation for reaching goal in 2012-2013. This webcast will feature industry experts who will define the benefits of existing building commissioning for the environment, occupants, operations staff, and overall ownership costs. Viewers will be able to recognize the varied scopes of commissioning, when to apply comprehensive versus focused commissioning, and best practices in existing building commissioning specifications & contracting. This FREE webcast will be broadcast live via the internet. Watch this page for more information about the program, speakers and registration. Date: April 23, 2015 & Time:1:00-4:00 p.m.
Building Demand Response & the Coming Smart Grid NEW! September 10-12, 2014, ASHRAE / IBPSA-USA Building Simulation Conference, Atlanta, GA.
October 2-3, 2014, ASHRAE, International Conference on Efficient Building Design: Materials and HVAC Equipment Technologies, Beirut, Lebanon. January 24-28, 2015, ASHRAE Winter meeting / AHR Show, Chicago, IL. May 22-24, 2015, 2015 International Conference on Energy and Environment in Ships, Athens, Greece. June 27-July 1, 2015, ASHRAE Annual Conference, Atlanta, GA.
January 23-27, 2016, ASHRAE Winter meeting / AHR Show, Orlando, FL. June 25-29, 2016, ASHRAE Annual Conference, St. Louis, MO. DId you know that there are currently over 130 individual courses, 18 course packages and 6 more Libraries? These can offer Continuing Education Credits between 2 hours and 320 hours, all at your our pace. ·April 17, 2014, Webcast - FREE! : Buildings in Balance: IEQ and Energy Efficiency - If you missed it, you can still download it. ·ASHRAE GreenGuide: Design, Construction, and Operation of Sustainable Buildings, 4th Edition is now released, with updated information on IEQ. o June 28-July 2, 2014, ASHRAE Annual Conference, Seattle, WA. o September 10-12, 2014, ASHRAE / IBPSA-USA Building Simulation Conference, Atlanta, GA. The ASHRAE Indoor Air Quality Guide is available for free download at www.ashrae.org/FreeIAQGuidance. Advanced Energy Design Guides: More than 500,000 copies have been purchased or downloaded for free at http://www.ashrae.org/freeaedg. Do you have your copy? ·April 17, 2014, Webcast - FREE! : Buildings in Balance: IEQ and Energy Efficiency. Registration now open at www.ashrae.org/ieqwebcast. There is no fee for registration. o Do you have an award winning project, wtih at least one year of operational data? Please fill in teh ASHRAE Technology award application and return to me by April 15th. o April 24-25, 2014, Efficient, High Performance Buildings for Developing Economies, Manila, Philippines. o January 26-28, 2015, ASHRAE Winter meeting / AHR Show, Chicago, IL. o June 2015, ASHRAE Annual Conference, Atlanta, GA.
o January 25-27, 2016, ASHRAE Winter meeting / AHR Show, Orlando, FL. o June 2016, ASHRAE Annual Conference, St. Louis, MI. o Feb 24-26, 2014, First International Conference on Energy and Indoor Environment for Hot Climates, Doha, Qatar. o January 2015, ASHRAE Winter meeting / AHR Show, Chicago, IL. o January 2016, ASHRAE Winter meeting / AHR Show, Orlando, FL. o See the December 3 news release for the ASHRAE Technology Award Recipients. First place went to a renovation in Seattle - I think there is a tour scheduled at the Annual Meeting. I believe there is a lot of great design in our city, and I would encourage you to think about submitting an award application. Buildings need to be in operation for one year. Please let me know if you are interested! ·Are you interested in ASHRAE Training sessions? Some possibilities include a repeat with Ralph, other "soft skills", or a technical presentation. Recently, ASHRAE Saskatoon has offered Fundamentals of Air System Design and Fundamentals of Water System Design - what would you like to see? o Jan. 16, 2014, AHRI Low-Global Warming Potential Alternative Refrigerants Evaluation Program, New York, NY. o Jan. 18-22, 2014, ASHRAE Winter Conference, New York, NY. o Jan 20-23, 2014, AHR Expo, New York, NY. Thanks to everyone who attended the Essential Leadership and Business Development Skills Seminar, and thank you to Ralph for coming to lead this! We had 22 attendees, including 10 non-ASHRAE members. With the course over, we can now look to other courses for the spring. Some possibilities include a repeat with Ralph, other "soft skills", or a technical presentation. Recently, ASHRAE Saskatoon has offered Fundamentals of Air System Design and Fundamentals of Water System Design - what would you like to see? o See the December 3 news release for the ASHRAE Technology Award Recipients. I think there is a lot of great design in our city, and I would encourage you to think about submitting an award application for next year. Please let me know if you are interested! - Essential Leadership and Business Development Skills for Professionals, by Ralph Kison will be held on November 12 and 13. Registration fees: ASHRAE Member $350, Non-member $450, Student $150. Please see previous post for registration form – sign-up now to save your spot! REGISTRATION DEADLINE – THURSDAY, NOVEMBER 7TH. The seminar will provide attendees with timely and relevant content and material being presented to ASHRAE and related associations and firms in the engineering sector in North America. Opportunities for group interaction discussion and will be used to engage the attendees and provide maximum value and resources to apply immediately with their clients and project teams. Jan. 16, 2014, AHRI Low-Global Warming Potential Alternative Refrigerants Evaluation Program, New York, NY. Jan. 18-22, 2014, ASHRAE Winter Conference, New York, NY. Jan 20-23, 2014, AHR Expo, New York, NY. Feb 24-26, 2014, First International Conference on Energy and Indoor Environment for Hot Climates, Doha, Qatar. April 24-25, 2014, Efficient, High Performance Buildings for Developing Economies, Manila, Philippines. June 28-July 2, 2014, ASHRAE Annual Conference, Seattle, WA.